Over a 3-month period from October to December 2005, the Central Statistics Division (CSD) of the Commonwealth of the Northern Mariana Islands’ Department of Commerce conducted a Household Income and Expenditure Survey (HIES). This survey used two types of survey methods to gather data. For the more expensive and less frequently purchased items, such as major appliances, electronic goods, new and used vehicles, etc., a pre-printed, survey questionnaire was completed by an interviewer. For those items which are more frequently purchased, such as food, tobacco, drinks, etc., the household respondent was given a diary to record all purchases during a one-week period. A random sample of 1,200 households was selected for the HIES in Saipan, which is the capital and the most populated island in the CNMI and about 125 households were selected from each of the islands of Rota and Tinian. From that initial sample, 1,141 households completed the survey questionnaire. From those households, a sub-sample of 700 households was given a diary to record household purchases. In December of 2007, Justin H. Andrew of CSD and Dr. Michael J. Levin, from Harvard University processed the data. Assisting them in 2008 were Mr. Wil Maui of DataTalks and Mr. Brian Hannon, an Economic Statistics International Consultant was hired to assist the CSD in rebasing the CPI. The survey items and expenditures were arrayed using the U.S. Bureau of Labor Statistics CPI classification system as a frame of reference. Then, using a statistical technique called “Probability Proportional to Size”; the CSD selected a new item sample. Using the PPS technique to select the item sample ensured that those items with the highest monthly household expenditures were selected in the sample. The sample included a total of 161 items for Saipan, 147 for Tinian, and 129 for Rota. Using the BLS Classification System as a frame of reference allowed the CSD to expand the number of groups included in the CNMI’s CPI. Instead of having five (5) major groups, the revised CPI now has nine (9) major groups. Having more groups allows the users to understand better which groups are responsible for the increases/decreases of the CPI. In the previous CPI, for example, alcoholic beverages were a part of the Health and Recreation Group. Now, it is one of the 4 new groups. The others are: Medical Care, Education and Communication and Other Goods and Services. The previous CPI collected price data from 18 different outlets. In the revised CPI, the number of retail outlets has been expanded dramatically and the outlet sample now consists of roughly 170 different retail outlets in Saipan, 30 in Tinian and 60 in Rota, which are geographically dispersed throughout Saipan, Rota and Tinian. This substantially larger outlet sample will ensure that the retail price data are collected from a wide variety of outlets dispersed throughout the three locations. The CSD has made another enhancement to the CPI by increasing the data collection training and by formalizing this vital aspect of price collection by developing a Data Collection Manual. This new manual covers virtually all aspects of price collection ranging from initiating the retail outlet to the rules for selecting a retail item and re-pricing. This new manual will improve data collection quality because it will provide guidance to the data collectors in handling almost any type of re-pricing situation. In the 4thQuarter of 2008, data collectors collected price data for both the old and revised CPIs and the two indexes were “spliced” together at that point. In order for two indexes to be linked together, there must be at least one period where prices are collected for both the old and the new indexes. This overlapping period was the 4th Quarter 2008. Beginning in the 1stQuarter 2009, the CSD collected price data for only the items in the revised CPI. Therefore, up to the 4th Quarter 2008, the index change is based on the old basket of goods, whereas from 1st Quarter 2009 onwards, the index change is based on the new basket. Another change in the CPI was rebasing it from the 1stQuarter 2003 = 100 to the 4thQuarter 2008 = 100. This is a mathematical change in the CPI but the more recent base period will make the CPI easier for users to understand. There is no difference in the percent changes from the old CPI from one period to another. 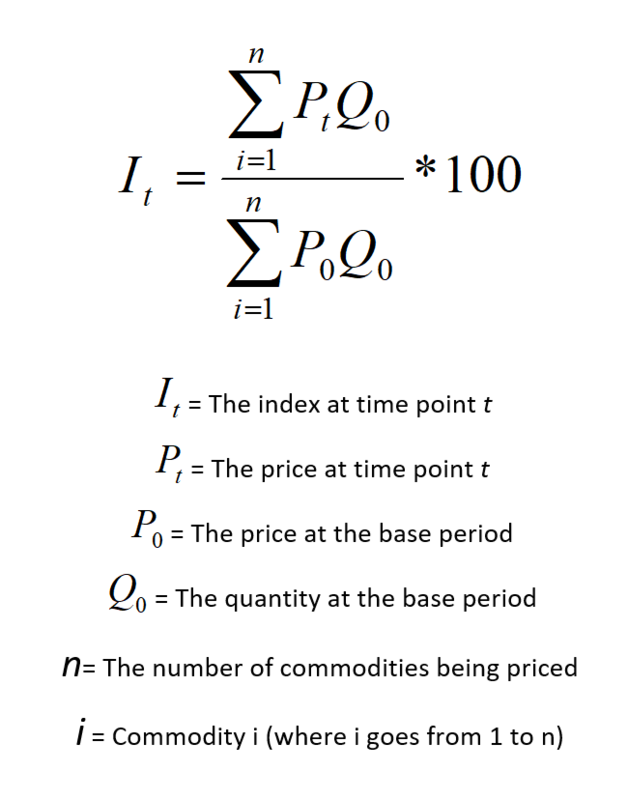 This method of index computation uses the quantities of commodities purchased in the base period as the basis for computing the value of the “market basket.” First, there are n number of items in the market basket with each having a base quantity. Each of these items has a base price, p0 and current price, pi. Multiplying p0 with q0 gives the total expenditure for a particular commodity for the base period. Current expenditure for an item is obtained by multiplying pi with q0. The sum of current expenditures for all items in the market basket is expressed as ? piq0, while the sum ?p0q0 is the total market basket expenditures in the base period. Notice that in both summations the term q0 remains constant, which means by using the same quantities only price changes are reflected in two pricing periods. For those unfamiliar with statistical notation, trying to read and understand the above explanation can be an intimidating experience. In layman’s terms, the above simply means that all of the items in the CPI are priced every quarter and the prices for each item in the current quarter are compared to the same prices in the base period. The base period is the 4thquarter 2008 when the CPI was set equal to 100. That is when the CPIs for each of the 9 major groups and the All Items = 100. The CSD uses a slight variation to this formula. Each quarter, the average of the prices that are collected for each item are compared to the average of the same prices in the previous quarter – not the base period. This is only done for items which are priced in both quarters. The average of the prices of an item in the current quarter is divided by the average of the prices in the previous quarter to calculate a price relative. This price relative is multiplied by the item’s weight in the previous quarter to update the item’s weight in the current quarter. This product is then divided by the item’s weight in the base period to calculate an item’s CPI. By summing the updated weights for all of the items in a group and dividing that sum by the same weights in the base period will calculate the group’s current CPI. Table 7 shows the quarterly inflation for each quarter since the 2nd quarter 2010, by group. As can be seen from this table the index increased by 3.5 percent for the 1st quarter 2017. The trend for “All Items” can also be seen in Chart 11 showing an increase when compared to the previous quarter. 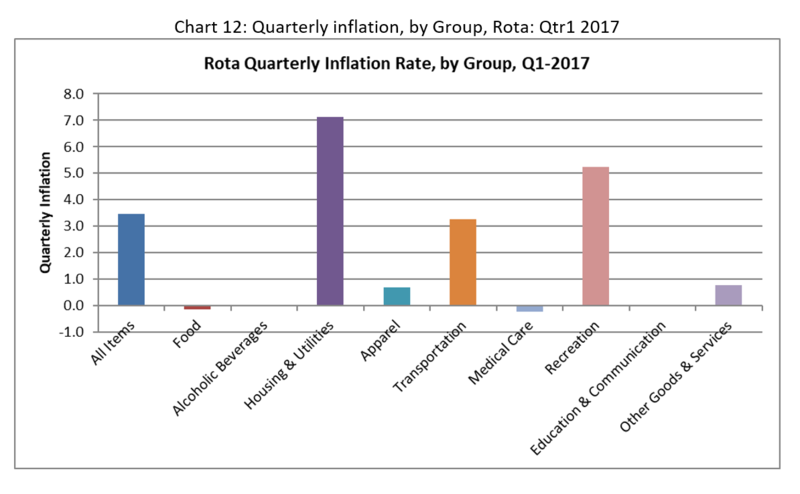 Chart 12 shows that “Housing & Utilities” group had the largest increase during the last quarter with a rise of 7.1 percent followed closely by “Recreation” group (5.2 percent). 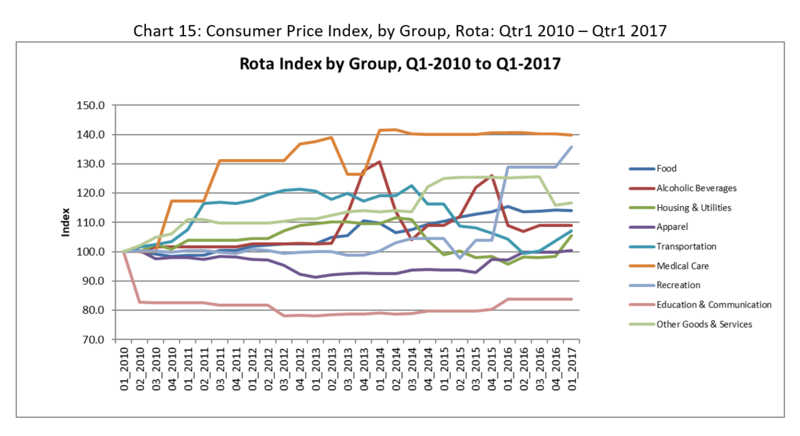 The other groups for Rota showed negligible changes over the last quarter. 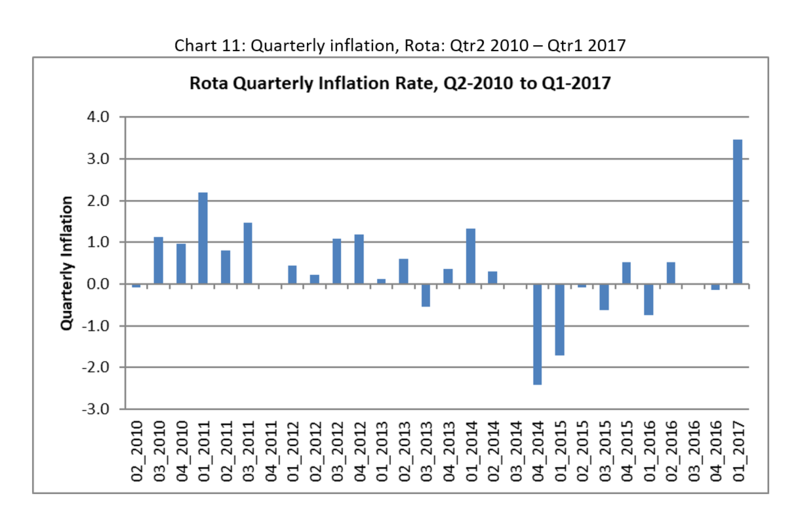 Table 8 below shows the annual inflation for Rota for the last 5 years ending 1st quarter 2017. 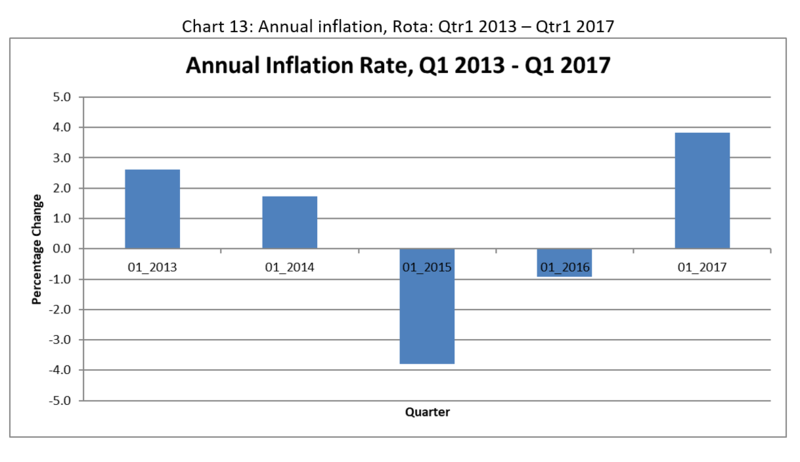 As can be seen from the table, there was a slight decrease in the annual inflation for All Items in 1st quarter 2017. 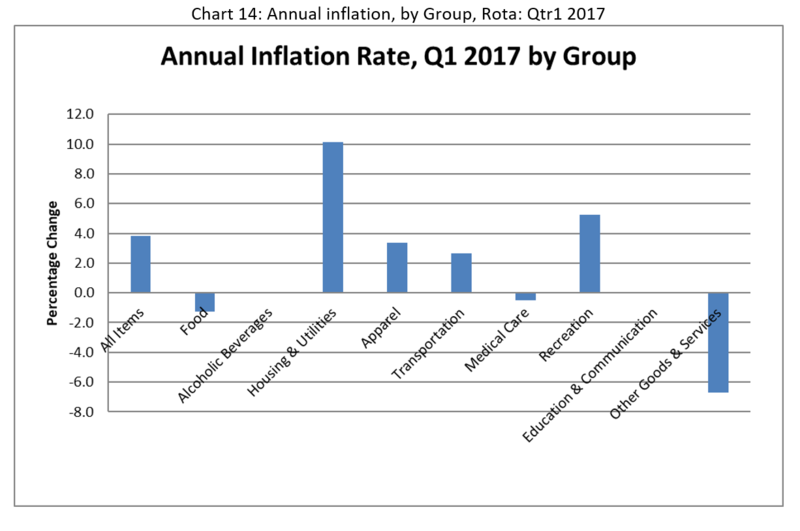 Chart 14 shows additional annual inflation analysis by group for the 1st quarter 2017. From this graph it can be clearly seen that “Housing & Utilities” group had the highest annual increase of 10.1 percent followed by “Recreation” and “Apparel” groups with 5.2 percent and 3.4 percent respectively. “Other Goods & Services” group had the largest decrease by 6.7 percent. Table 10 and Chart 15 below show the change in the index since the CPI was established in 1st Quarter 2010. The analysis shows that ”Medical Care” has had the most significant increase with the index rising by about 40 percent during this period, while “Recreation” showed the next biggest increase of about 36 percent. Meanwhile, “Other Goods & Services” and “Food” groups closely followed each other with an increase of about 17 percent and 14 percent, respectively, during this time.